Size: 1964 sq.ft. - 3042 sq.ft. After the success of Arabella Phase 1 & Phase 2 by Dubai Properties, the developer has announced the third phase of Arabella within the wonderful community of Mudon in Dubailand. Arabella 3 by Dubai Properties is a collection of 3 BR & 4 BR townhouses and 5 BR independent villas which was launched on April 2017. These opulent homes of Arabella 3 to provide active living that is surrounded by bustling community with unmatchable amenities as well as access to large Mudon Central Park. The project has guaranteed its residents a lifestyle of relaxation and tranquillity. This new off plan project provides townhouses & villas that are completely enveloped with lush green gardens and trees. The layouts of Arabella will be available by Q2 of 2020. 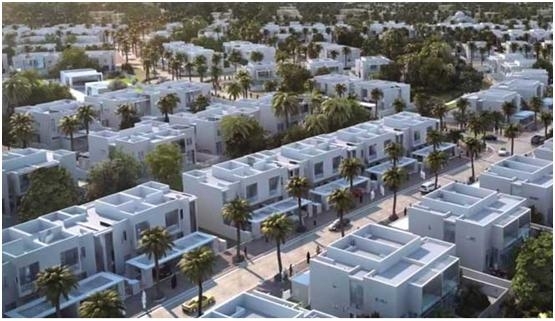 Arabella Phase – 3 prime residences offering 3 Bedroom Townhouses, 3 BR& 4 BR semi-detached townhouses and 5bedroom separate villas are the sizeable family homes. These typologies of Arabella phase 3is suitable to all kind of buyers who seek for secure & well popular project. This project holds a variety of living solutions with starting range from 1964 Sq.ft to 3042 Sq.ft. This community of Dubai Properties to offer active living surrounded by a bustling community. Arabella Phase 3 layouts are starting from AED 1,422,000 with an attractive payment plan. Dubai Properties was introduced in 2004 as Dubai based, United Arab Emirates company. The group is celebrating their success since 2002 when it commenced operations as Estithmaar Realty Group. Dubai Properties brings to the mix an in-depth understanding of the core residential needs of its tenants and investors, thus providing innovative real-estate and lifestyle solutions with over 15 years of experience in the real estate sector. Dubai Properties has so far delivered 40,000 residential units, and there are more than 100,000 people living in our communities, happy and safe. Dubai Properties ongoing projects includes Al Waha, Arabella, Casadora, Layan, Mudon,The Villa and Villanova in Dubailand, Bay Avenue, Ghoroob, Manazel Al Khor and Dubai Wharf located at Bay Square, Culture Village, Remraam, Serena, Bellevue Towers, The Executive Towers and Vision Tower at Business Bay and Shorooq in Mirdif. Arabella 3 project is one of the unique residential communities situated in Mudon at Dubailand, Dubai. It is an exciting location in Dubai having shopping, sporting and entertainment facilities near the residence. Dubailand is a destination to 45 mega developments and over 200+ leisure, tourism and entertainment facilities. Arabella Mudon is quite near the city’s crowd off Al Qudra Road i.e. opposite to Arabian Ranches community near to Motor City, Dubai Cycling Course and Sports City. Arabella 3 is in close proximity to Dubai's iconic landmarks at the distance of 3 minutes to 10 Minutes, Dubai Mall - 17 minutes, Academic City - 3 minutes, Mall of Emirates - 15 minutes, Emirates Towers - 8 minutes, Dubai International Airport - 9 minutes, Outlet Mall - 6 minutes, DIFC - 7 minutes, Dubai International Financial Centre - 7 minutes and it is also accessible from Emirates Road, Mohammed Bin Zayed Road. Arabella 3 is located within the Mudon community which is located along Al Qudra Road with easy access through Emirates Road and Sheikh Mohammed Bin Zayed Road. The Amenities of Arabella 3 includes - Covered Parking, Children Playroom (Indoor), Recreational facilities, 24 X 7 Security, Swimming pool, Jogging Track,Children's Play Area, Community Centre, Games Room, High-quality Fixtures, Iconic Views, Football Field, Landscaped Gardens, Guest Parking area, Retail Facilities, Modern Interiors, Private parking, Copper Wiring Concealed and Aluminium Sliding Windows with good floor to floor height. Schools - Blossom Mudon Nursery Dubai, , Ranches Primary School, Sustainable City Nursery, Jebel Ali School. Shopping Malls - Mudon Al Salam Town Center, The Ranches Souk. Mudon Hotels - Auris Fakhruddin Hotel, Golf Terrace Hotel Apartments, Ghaya Grand Hotel.